Sweet soul music has been covered 91 times. He performed SWEET SOUL MUSIC in full a few times during The River Tour, Tunnel Of Love tour, Working On A Dream Tour, the Wrecking Ball Tour, and off-tour. The first time he played SWEET SOUL MUSIC at Palais Des Sports De Saint-Ouen in Paris, France, during The River Tour. This was the first time, that the song was played in full instead of being a short snippet played as part of DETROIT MEDLEY. Bruce generally performed SWEET SOUL MUSIC as part of DETROIT MEDLEY or TWIST AND SHOUT, and occasionally during the band introductions in ROSALITA (COME OUT TONIGHT) . 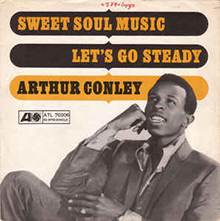 "Sweet Soul Music" is a soul song, first released by Arthur Conley in 1967. Written by Conley and Otis Redding, it is based on the Sam Cooke song "Yeah Man" from his posthumous album Shake; the opening riff is a quote from Elmer Bernstein's score for the 1960 movie The Magnificent Seven. Sam Cooke's business partner, sued both Redding and Conley for appropriating the melody. A settlement was reached in which Cooke's name was added to the writer credits, and Otis Redding agreed to record some songs in the future from Kags Music, a Cooke–Alexander enterprise. Going to a Go-Go, by the Miracles; the group is not explicitly mentioned. A brief instrumental version of the chorus for the song is quoted, after Conley says, "Hit it, Otis". Additionally, James Brown is described as "the king of them all". At the end of the song, Arthur Conley sings, "Otis Redding got the feeling." Get in on this one!